There are still a few places left on this workshop! Explore the possibilities of making wire teaspoons from fabric, wire and wax. During the workshop you will create lots of different shapes from light weight wire that can easily be manipulated with your fingers tips. They can be decorated however you wish using trimmings, buttons and hand-stitch. Explore the possibilities of making wire teaspoons from fabric, wire and paper. During the workshop you will create lots of different shapes from light weight wire that can easily be manipulated with your fingers tips. They can be decorated however you wish using trimmings, buttons and hand-stitch. Priscilla will share with you the creative techniques developed through her own experimentations. You will make your very own 3D sculpture inspired by whatever theme you wish… using wire, wax, and found ephemera – then embellish with paper, buttons, beads and trimmings. Materials will be provided all you need bring is enthusiasm and some found objects or materials from your own collecting. Using various fabrics, acrylic paints and machine stitch you will create a contemporary free machine embroidered hanging for your wall. During the 2 day course you will explore a range of techniques to enable you to produce a finished piece that is personal and will reflect your own ideas. This is fantastic workshop for anyone who would like to explore a mixed media approach to stitched textiles and develop new ways of working. Some sewing experience would be an advantage but not necessary. If you have a sewing machine with a free embroidery facility please bring along with you or request to borrow a machine when booking your place. Decorum was established in 2017 and comprises of four textile artists all graduating from the BA Embroidery Degree at Manchester Metropolitan University. We are very exited to be showing at The Platform Gallery in the beautiful Ribble Valley for our touring exhibition. I will be offering a workshop ‘Book of Flowers’ 23rd August and ‘Sculptural Spoons’ 12th September as part of this exhibition, please contact me directly priscilla@priscillaedwards.co.uk if you are interested. There are limited places available so early booking is essential. You will create a garden of decorative sculptural flowers using wire, fabric, paper and paint. Then arrange your collection and add them to a vintage book base creating a stunning garden of flowers that lasts forever. They can be decorated however you wish using trimmings, buttons and hand-stitch. All abilities welcome and materials provided, just bring an unwanted book! There will be a £5 materials charge payable on the day which includes your A4 size canvas, paints and fabrics etc. You are encouraged to bring your favourite materials scraps and any embellishments you may already have plus inspirational pictures or references you come across. Priscilla will share with you the creative techniques developed through her own experimentations. 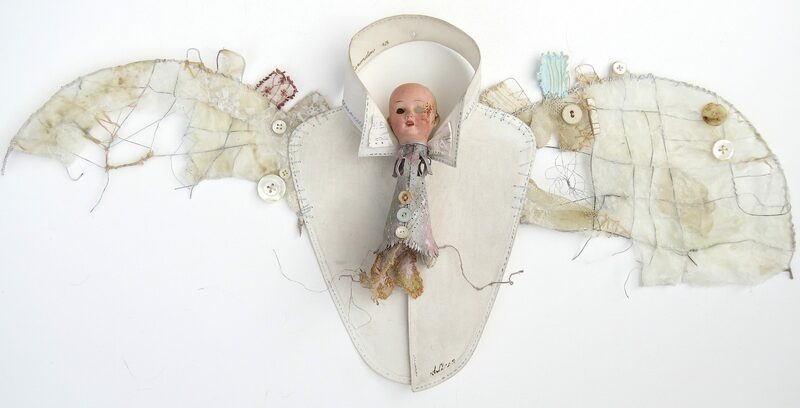 During the workshop you will make your very own 3D sculpture inspired by whatever theme you wish, using wire, wax, fabric and found ephemera – finishing off your beautiful piece with further embellishment including paper, buttons, beads and trimmings. Materials will be provided all you need bring is enthusiasm and some found objects or materials from your own collecting.